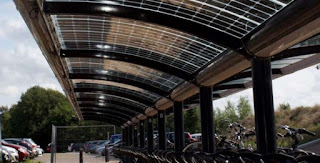 You know that photo of a parking lot where the rows and rows of cars are covered with a canopy of solar cells? "Share and Like if you think every parking lot should look like this!". Umm no. I've always argued that the ideal parking lot, say, for a mall, should have several dozen parking spots close to the entrances, all for handicapped parking. Plus a bus stop. This is a typical bike lot in the Netherlands. It can accomodate a dozen bikes in the space ordinarily taken up by a single car. A roof protects the bikes against frequent Dutch rains. But this one has a novel catch: solar panels on the pleasingly curved surface. These are architectural thin-film solar cells that are bendable: so you don't need a flat surface to mount them on; they can be applied to buildings with visually interesting curved surfaces. Think of what an archtect like Zaha Hadid could do with that! Wow! You're so right: all rail stations should have these. And all libraries, schools, government buildings and - all right - malls.